Penny Rohleder who got the painting from her 5-year-old son Julian, asked him why there was red on her and she said his answer had her in hysterics. "What's that red thing on me?" she asked. "That's your period," the innocent boy answered. "Oh this is so funny. Julian drew a family portrait (forgot Mayanna and Arlyn) but I said to him "what's that red thing on me?" He said "that's your period". Bahahahhahahahahshahahaha"
"When I first saw the drawing and realised that it included my period, I was in hysterics. It was such an innocent, honest thing for a young child to come out with. 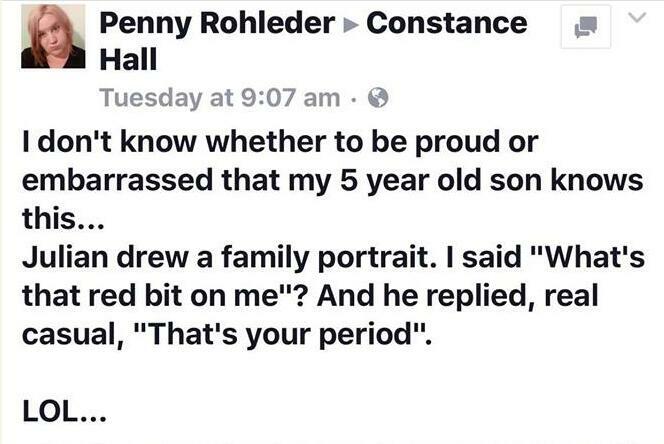 "I shared it because it was funny, but I was also proud that my five year old knows what a period is, when some fully grown men do not. It's such a taboo subject for many adults, especially men. Women too, are embarrassed about their bodies and I have absolutely no idea why." 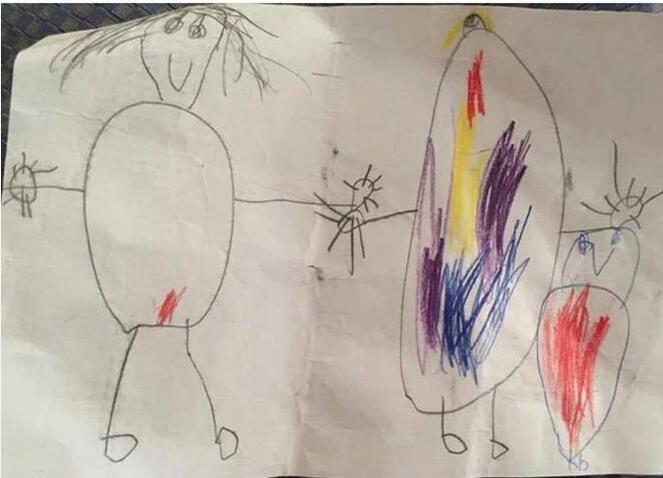 After Penny shared the photo, a number of people thought it was amusing but there were also a lot of people who thought it was inappropriate for Penny to have changed her pad in front of her young children, and this started a debate. Penny became ill with a pulmonary embolism just before her youngest son was born, so she was put on blood thinning treatment. Blood thinners make one's period really heavy and messy and this means sometimes, her children get to see that side of her, especially Julian, who has always shown concern for his mother's health. She said: "Many people have commented that it's not a normal thing for me to change my pad or tampon in front of my kids, but when you’re on blood thinners and get your period, it can be horrific and very messy and urgent. I can’t help that. We have one toilet in our house, and what else was I supposed to do, bleed everywhere? It's a topic I guess that came up with my kids out of necessity I guess." Penny's kids are already used to seeing her on her period and they see it as the normal body function it is. It doesn't make them uncomfortable.